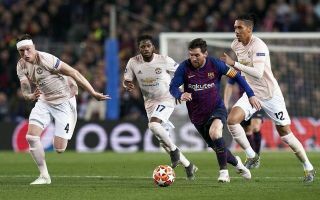 Manchester United looked out of their depth against Barcelona this evening, thanks to a marvellous display from Lionel Messi, the Catalan giants won 3-0. It looked like United could mimic their heroics in Paris after a promising opening ten minutes to the game, United couldn’t make it last and Messi stunned them in the 16th minute with an excellent goal. Take a look at it here. You could tell that it wasn’t United’s night when David De Gea made a costly error in the 20th minute, which saw Messi double his side’s lead. Take a look at it here. Liverpool fans will love the fact that Philippe Coutinho rubbed salt into the United wounds by scoring a sensational strike in the 61st minute. Take a look at the wonderful effort here. With all respect to United and Solskjaer, they simply had no chance of putting a stop to Barcelona’s frightening attack. Messi and Co. just have too much firepower for the likes of Phil Jones, Chris Smalling and Ashley Young. United already had a mammoth task ahead of them, but with Messi in magical form – their hopes of winning tonight’s tie looked impossible. Some fans singled out Ashley Young after the defeat, whilst the 33-year-old was outclassed today, the fault can’t all be placed on his shoulders. Young should be commended for transitioning to full-back in recent years, the England international has at least tried and the same can’t be said for some of his teammates. 1-0 – Ashley Young awful as always, Chris Smalling shows Messi on his left foot. 2-0 – David De Gea howler. I have no words. 3-0 – Chris Smalling shows Coutinho on his right foot. Completely shot ourselves in the foot tonight. Let us all down. See now we all talk about signing the big names the big personalities yet when we do that look at our results still? Look at this Ajax team how many big names? Egos? And they’re flourishing. Playing good football. As a team. Get Ashley Young out of my club btw. Smalling & Jones vs Messi & Suarez. Ole’s not just at the wheel, but he’s got a great sense of humour as well! Pogba is the laziest player I’ve ever watched. His heads already elsewhere. No more Ashley Young please! Ole Gunnar Solskjaer must switch his attention to firing up his side for their battle for a finish in the top four. The Red Devils first step on that mission comes against Everton at Goodison Park on Sunday afternoon.